Tour de March: Day 1. It’s amazing what a few friends can put together when they put your minds to it. Late last year, we put aside one day of holiday each to string out the weekend and made some vague gestures towards a map of the UK that were suggestive of a potentially coherent mini-Tour. As time marched on, vague trajectories became concrete routes, hotel possibilities became deposits that had left our bank accounts and friends’ parents houses had been requested and confirmed. 4 of us rolled out on the Saturday — Hendo and I from south-east London by way of Angel to pick up Gorrod and Sam. As is tradition with group rides such as these, Hendo and I ensured we were adequately late in reaching Gorrod, Hendo helping to ensure this was the case by deciding 30 minutes before leaving his house that he’d switch his wheels out to the new pair of Zipps he’d just purchased. 20 minutes late, we unashamedly hurried Gorrod and Sam along before heading north for Epping Forrest. We’d covered about 30km before the traffic seemed to subside as aggressively and quickly as it had been passing us. Along with the traffic and high-rise buildings, we also left behind that strange, ominous warmth that London seems to generate through some combination of its congested roads, densely packed streets of houses, flats and offices and its amalgamation of frenetically busy inhabitants and visitors. The drop in temperature was tangible and my optimistic decision to don fingerless gloves for the first time this year was at once deemed ill-informed by the weather. There was a definite easterly wind that was bringing with it a chill that we’d yet to shake off by the time we found ourselves on the other side of Epping Forrest, in Sawbridgeworth. We hoped a cup of warm coffee and the wait for it inside a heated building might help take the edge off. Only 3 out of 4 of us took The Shed up on this offer once we’d pulled in and unclipped. Sam, still firmly in a London state of mind, was adamant on guarding our bikes outside. In his defence, he was (and no doubt still is) still reeling from the recent theft of his Cube from outside his work, so it as entirely understandable. Empathetic friends that we are, we left Sam outside in the cold watching over all of our bikes and basked in the momentary warmth of the cafe. Our comeuppance was served piping hot via our drink choices and Gorrod, Hendo and I, in that order, all burnt out mouths (after each of us warning the other just how hot the drinks were). After the tree-lined, picturesque roads and fluid bends of Epping, the ride didn’t seem to find its stride for me again until after lunch, which was enthusiastically consumed at The March Hare Tea Room in Buntingford. As we gathered inside to pay, Sam headed into the loo. Knowing we had a substantial amount of time to play with as Sam fought with the logistical nightmare of using the toilet whilst wearing bib shorts, we couldn’t resist the temptation of hiding his bike. Because it’s always funny to aggressively poke at a fresh wound. He found the whole thing as hilarious as a recent victim of theft might be expected it to. We laughed, too. As we neared Cambridge proper, first came the surrounding countryside of Cambridgeshire. What would be considered hills on this ride would, on any other day, be more accurately described as humps and so didn’t put too much pressure on any of our legs. Instead, we were able to enjoy the undulating landscape of farmed fields, the stark contrast of the rich green of the hedgerows, the dark brown soil, the sand-coloured wheat fields and what had turned into a bright blue sky. These vistas (yes, I’m being ever-so-slightly hyperbolic) were only broken by the occasional placement of a farmhouse or, even less occasionally, a windmill. The historical city of Cambridge was brushed aside as we made our way through its outskirts to arrive just north of it, at The Jolly Brewers in Milton: a pub-slash-B&B and our bed for the night. I use these rides as an excuse to see what I can get away with packing, or, more accurately, not packing). Of course, there are essentials that cannot be left home without (I’ve learnt this the hard way): 3 inner tubes, 2 tyre levers, a bike tool, a bike pump, ride snacks and a waterproof shell tend to do the job. 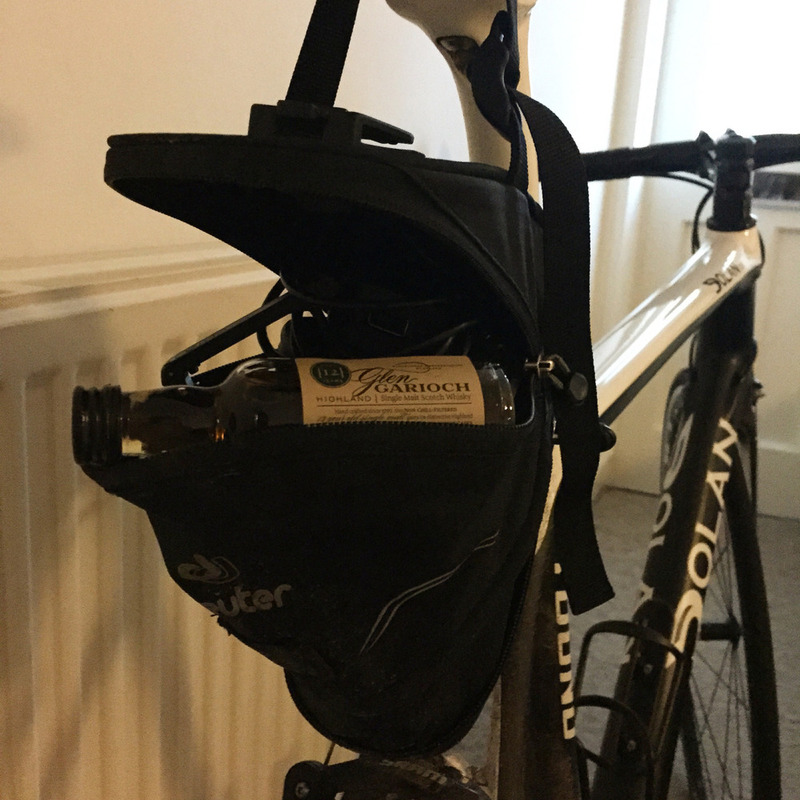 There are also things that I need to bring from an off-the-bike perspective: glasses, contact solution, a miniature bottle of whisky. But there are some things I consider a luxury not worth buying a bigger saddle bag to accommodate. Namely, a change of clothes for the evening, any spare cycling jerseys or fresh underwear. Make of that what you will, but the requirements for short cycling excursions dictate that the inherent need for fresh pants will be minimal. It being before 6 o’clock in the evening when we arrived, then, meant there was only one thing to do. Still very much clad in our lycra (and 2 of us in our matching kit), we waddled over from our rooms to the pub in our cleats, planted ourselves in a room full of strangers enjoying a few beers whilst watching the 6 Nations and did the same. We then created the same strange scene in the pubs restaurant. As I scraped the bowl that, moments earlier, contained an entire sticky toffee pudding and ice cream whilst a large, bald man on a nearby table looked suspiciously at our shoes, I realised I probably should have eaten more on the bike throughout the day. I’d already devastated a pile of ham faggots, a slab of cheesy garlic bread, a plate of pie and chips and anything else that anyone else had managed to leave on their plates (how they found themselves full, I do not know). Rolling in my smaller-than-single bed from my right side onto my left to reduce the discomfort of a food-induced stitch, I vowed to avoid doing the same again tomorrow.